In 1959 Bo asked a former Gretsch employee known only as "Juliano" to build him some guitars from his designs using Gretsch necks and hardware. 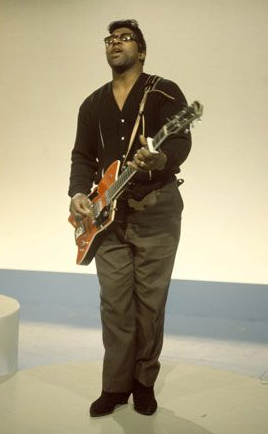 The resulting three guitars, the Jupiter Thunderbird, the Cadillac and the Cigar Box became synonymous with Diddley and his 1960's stage partner "The Duchess". The Jupiter Thunderbird was later given to ZZ Top's Billy Gibbons who used it on some recordings. Since Gibbons didn't want to risk subjecting the rare guitar to touring and live performances, Gibbons approached Gretsch with the idea of reproducing the Jupiter Thunderbird. The end result was the "Billy-Bo" Jupiter Thunderbird which Gretsch launched in 2005.